In preparation for the most recent blizzard (Juno), my mom called urging me to stock up on nonperishable and no-cook food, in case of a power outage. As I entered Whole Foods that Monday afternoon (the ultimate post-work/pre-blizzard grocery frenzy), my mind went blank. Food that doesn’t require cooking? What I am supposed to do? 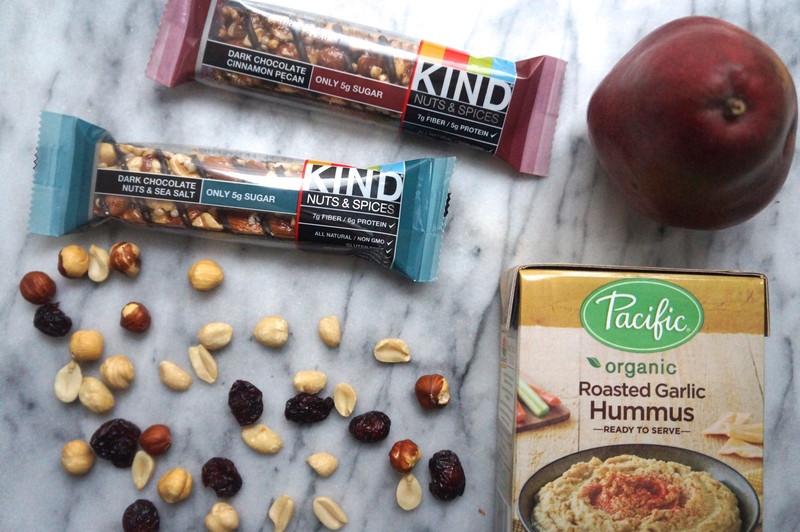 Eat packaged junk? 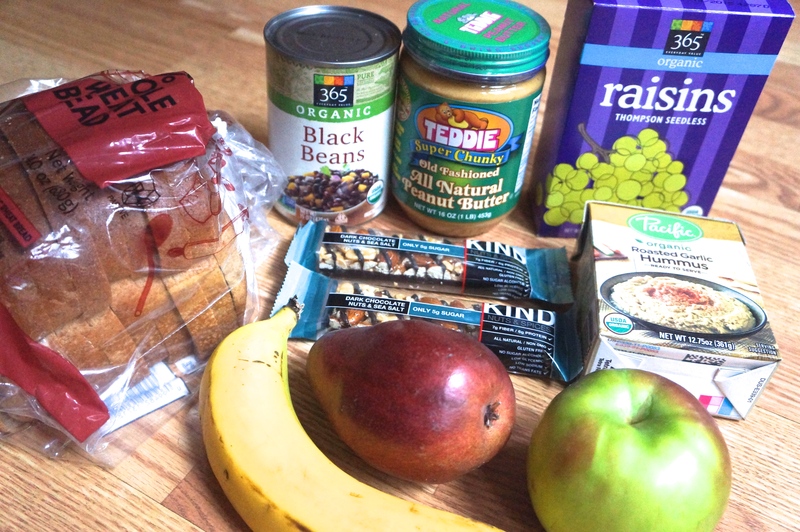 Not knowing what to buy (and feeling anxious to join the ever-growing checkout line), I grabbed apples and bananas, a can of lentils, a loaf of whole wheat bread, and a couple of KIND bars that I saw near the register (#impulsebuy). Luckily, our power never went out, so I spent my snow day enjoying warm, cozy meals, such as this spaghetti squash bowl. Now that I’ve had some time to form a plan, I thought I would share some meal ideas that don’t require cooking, power, or any refrigerated items. Hopefully this will give you some ideas for what to stock up on before the next storm! 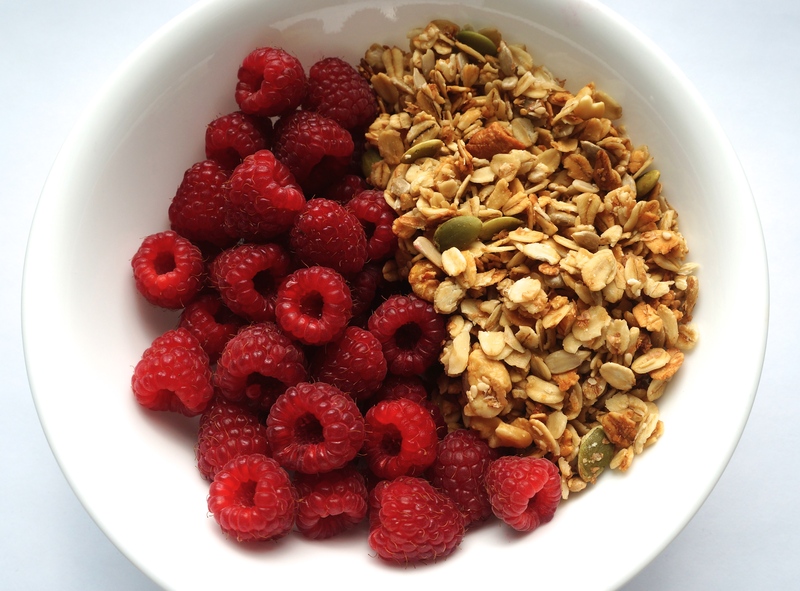 Breakfast: Granola with fresh berries. Shelf stable almond milk (or even shelf stable dairy milk) might be a welcome addition to this bowl, although most shelf-stable milks recommend refrigeration after opening, so it’s good to have more than one carton on hand. Also note, berries certainly keep much longer in the fridge, but they won’t spoil if you keep them on the counter for a day or two. After all, they’re outside for hours and hours at farmers markets and farm stands. 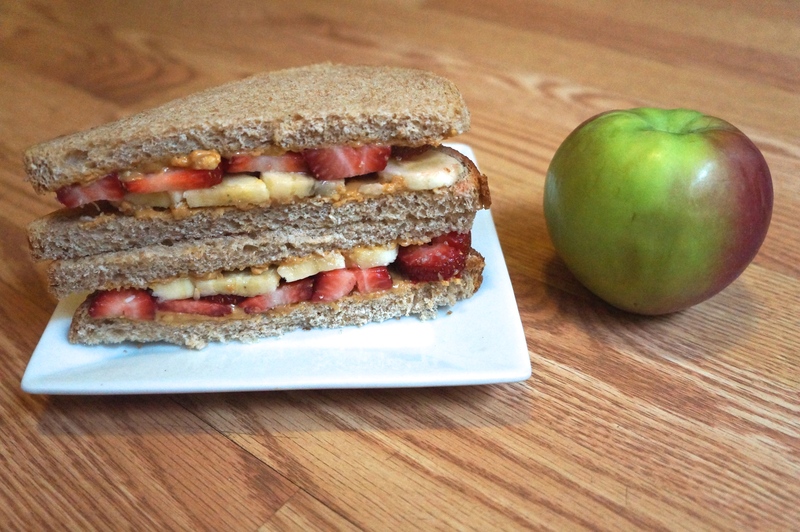 Lunch: Peanut butter sandwich with strawberries and bananas, plus an apple. You can make this more exciting by trying different nut butter and fruit or jam combinations (almond butter + figs, cashew butter + raspberry jam, etc). Note that most natural nut butters (aka, the only nut butters worth buying) recommend refrigeration after opening. However, that is mainly to preserve freshness. Natural peanut butter won’t go rancid if you leave on the counter for a few days, it just won’t last quite as long. 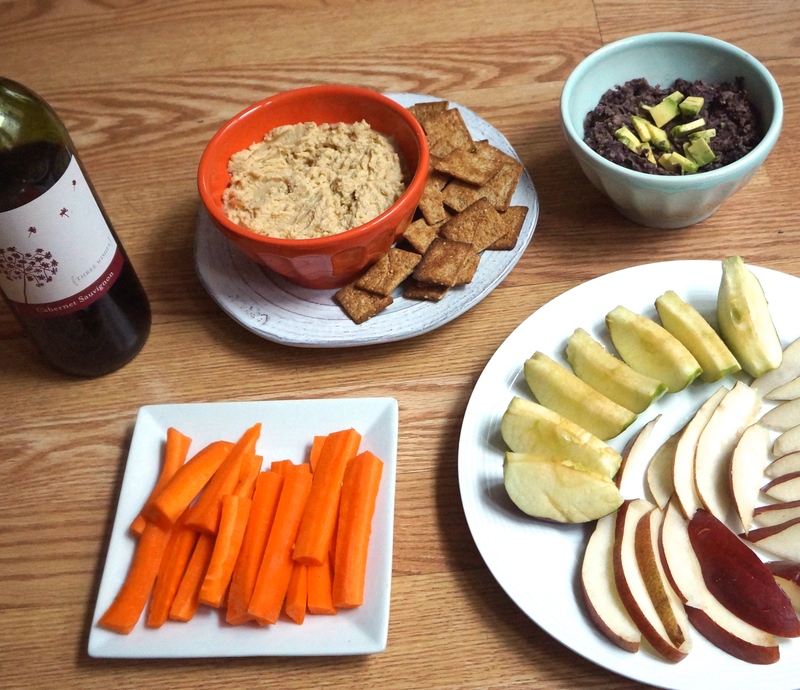 Dinner: Mezze platter with bean dips, whole grain crackers, fruit, nuts, olives, chocolate, and & wine. White bean dip: Drain (and rinse, if possible) a can of white beans. Mash with a fork and add olive oil, onion powder, garlic powder, a pink of cayenne, and salt and pepper to taste. Serve with carrots and whole grain crackers, such as these Kashi Original 7-Grain Crackers. Black Bean Dip: Drain (and rinse, if possible) a can of black beans. Mash with a fork and add a few spoonfuls of salsa, cumin, and salt and pepper to taste. Top with diced avocado and serve with whole grain crackers or baked tortilla chips. Small bites: Jarred olives and nuts, such as almonds or cashews, make great finger food. For fruit, sliced apples and pears are always a popular choice, but berries are great too. Also, be sure to have a quality chocolate bar on hand to break apart and nibble at. Wine: It’s a snow day! If you’re going to be stuck indoors, you might as well uncork a bottle and celebrate! Tips: I recommend washing fruits and vegetables the night before you think you may lose power, just in case your water goes out as well. Also, be sure to fill up your water bottles and mason jars with water, or stock up on water bottles. For more information on food safety during power outages, check out this webpage from the USDA. Fantastic Ideas for food stocking. It takes such a small amount of healthy ingredients to make a complete meal. Vegetable, chicken, or beef broth can be heated with instant oats as a great energy source too. Thanks! And how creative?! I hadn’t even thought of that idea!